When I was growing up the common green vegetable found on our plates was green beans or peas. Very rarely did we have broccoli and I didn’t even (as far as I can recall) try asparagus or artichokes until I was a teenager (my siblings are very picky eaters, even to this day). ……UNTIL NOW! The other day when I was cooking dinner Eric asked for broccoli (of course). But instead of steaming it I roasted it with a little garlic and pepper infused olive oil. YUM! I went straight to the broccoli first; completely by-passing Eric’s Famous Mashed Potatoes and my Mom’s lemon peppered chicken (the recipe coming soon). I even had seconds of just the broccoli. I couldn’t help it! 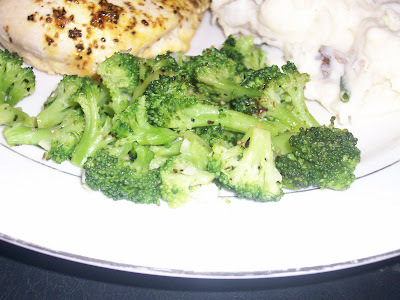 The broccoli was so full of flavor and was just the right texture (not crunchy and not mushy). Preheat oven to 375-400 degrees (normally I would not give a temperature range, however the broccoli will cook well at either temperate- this is good, especially if you have other food in the oven). Cut broccoli into florets. Spread broccoli onto a cookie sheet. Drizzle olive oil on top and sprinkle with salt and garlic. Toss broccoli around in the olive oil, garlic, and salt- making sure all of the broccoli is evenly coated. Bake at 375-400 degrees for about 12 minutes or until the “doneness” of your liking. When I buy olive oil I set aside 1 cup of it in a jar or Tupperware that has a good tight lid. To this one cup of olive oil I add 1 tablespoon of crushed black pepper. I use the infused oil for roasting veggies, sauteing meat, etc. The pepper gives the oil a stronger flavor than just sprinkling the veggie or meat directly with pepper as it cooks.